Biological Research on Addiction examines the neurobiological mechanisms of drug use and drug addiction, describing how the brain responds to addictive substances as well as how it is affected by drugs of abuse. The book's four main sections examine behavioral and molecular biology; neuroscience; genetics; and neuroimaging and neuropharmacology as they relate to the addictive process. This volume is especially effective in presenting current knowledge on the key neurobiological and genetic elements in an individual’s susceptibility to drug dependence, as well as the processes by which some individuals proceed from casual drug use to drug dependence. 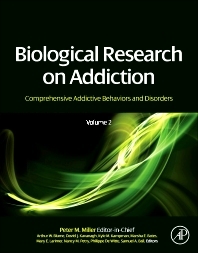 Biological Research on Addiction is one of three volumes comprising the 2,500-page series, Comprehensive Addictive Behaviors and Disorders. This series provides the most complete collection of current knowledge on addictive behaviors and disorders to date. In short, it is the definitive reference work on addictions. What Is the Function of Adult Hippocampal Neurogenesis? How Do Addictive Substances Influence Adult Hippocampal Neurogenesis? How Do the Results of Studies with Experimenter-Delivered Drugs Influence Our Understanding of the Role of New Neurons in the Process of Addiction? Are the Animal Data Relevant for Humans? Peter M. Miller, Ph.D., is a clinical psychologist and Professor of Psychiatry and Behavioral Sciences in the Center for Drug and Alcohol Programs at the Medical University of South Carolina. He is Editor-in-Chief of the journal Addictive Behaviors and an experienced researcher and clinician in the field of alcohol use disorders.